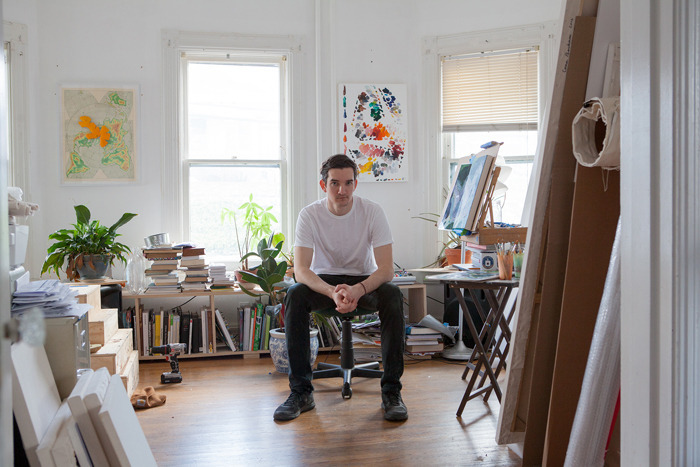 I recently had the pleasure of visiting Conor Backman at his studio in Bushwick. Conor moved into town this past September from Richmond, Virginia, where he completed a painting/sculpture double-major at VCU and, from 2009-2012, co-ran Reference Gallery. His best-known work combines trompe-l’oeil visual strategies with everyday source materials and speaks to an ongoing interest in precise re-creation as a means of purposeful reinterpretation. In one typical work, what look at first like crumpled pieces of paper overflowing out of a trashcan are actually sheets of metal, meticulously shaped and painted by hand. In another, thin plates of steel are precisely scored to replicate books with cut-up pages. A series of colorful abstract paintings are in fact exacting re-creations of markings left on palettes used for previous paintings and sculptures. A history textbook, folded open to Velazquez’s Las Meninas (itself an exercise in layered perceptions and feedback loops), is rendered in steel and painstakingly copied with oils. Last month, Berlin-based artist/writer (and former Reference co-director) James Michael Shaeffer wrote an insightful essay on Conor’s work in which he spoke of his friend’s propensity for “exposing the sublime in the mundane.” While I agree with James’ assessment in a certain sense, my own feeling is that Conor’s best work tends to be less about elevating commonplace items to the status of art than about tracing the (de-)evolution of various art historical modes from the avant-garde to the everyday. In so many of these works, we see Conor looking to his surroundings as a means of engaging with traditions long removed from contemporary discourse. Over time, for instance, scuffs and stains on a linoleum tile floor can come to resemble an Ab-Ex canvas. The colored specks on a piece of foam carpet padding can bring to mind the Pointillist techniques of Georges Seurat. The restrained aesthetics of minimalism seem to endure in retail furniture design. Stripped of text, beer containers evoke the romantic landscapes of the Hudson River School, while cereal boxes echo both tie-dye psychedelia and Color Field painting. Ultimately, I think one finds in these paintings not an attempt to bridge “low-“ and “high-culture” aesthetics (a distinction which, at least to me, feels fairly outdated and definitely unproductive), but rather an eagerness to engage with a series of styles and techniques which may have fallen out of theoretical fashion, but have never truly fallen out of sight. Annarumma is pleased to present Mrs. Fibonacci’s Traditional False Color Broccoli with Orange Sauce, a show of recent paintings and sculpture by New York-based artist Conor Backman. His first solo exhibition with the gallery, Mrs. Fibonacci finds the artist continuing his ongoing explorations of representation, reproduction, origin, and iteration. Central to Backman’s work is the process of translation: exploring the spaces between material and simulated states, he favors a highly fluid presentation, layering references, fidelities, and formats to purposefully disorienting ends. Digital prints are rendered in paint before being converted back to autonomous images; descaled reproductions of the physical world at once signify and supplant their corporeal counterparts; trompe l’oeil treatments ardently blur the line between authentic and imitation, copy and source: at each turn, Backman willfully combines and confounds disparate means of visual production, creating works which offset conceptual densities with aesthetic returns, the presumed line between direct and mediated experience now suddenly, grippingly obscure. For this exhibition, Backman has produced ten new works representing two of his most recent series. The first set, titled “Painting Palettes,” finds the artist producing oil paintings based on photographs of palettes from previous works. As he meticulously reproduces their offhanded daubs and markings, Backman mixes his pigments on the surface of the canvas itself, combining the perfunctory marks and represented gestures into singular, intuitive compositions. The finished works comprise two distinct elements – an image of a palette alongside an actual one – which, while having occurred simultaneously and from the same material, are nonetheless autonomous, neither any more or less “real” or than the other. With an effect not dissimilar to viewing a painting and its documentation simultaneously, the final images are at once physical and flattened, abstracted and enhanced by the artist’s recursive methods of (re-)production. Where earlier works in the series were rendered from aggressively cropped detail shots, however, this new sequence of canvases explores a more direct (if varied) approach, with the ratio of palette-to-canvas dimensions ascending from 1:1 to 1:8 over the course of the five works on view; where the rendered strokes of the smallest painting retain the scale of the original markings, the newly mixed paints of the largest work occupy an area roughly the same size as the entire corresponding palette. 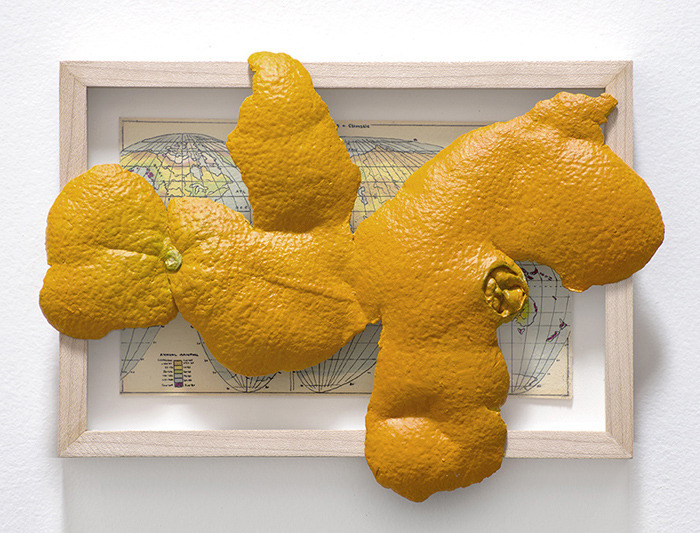 Also on view are five works from Backman’s series “The Sun Never Sets,” which finds the artist mounting hand-painted, highly detailed casts of orange peels upon the plexiglass surfaces of framed reproductions of homolosine projections (popularly known as “orange peel maps”). Like an inversion of the Borges fable quoted above, the underlying images gradually descend in scale as the series unfolds, ebbing until they’ve finally been obfuscated by –and incorporated into – the overlaid reliefs. As distinctions between subject and simulation collapse to form a single co-existing entity, the resulting works function as an analog to the problems of representational painting itself, which similarly translates its subjects into images through a process of reductive flattening. Like so much of Backman’s output, the works on view in Mrs. Fibonacci ultimately seek meaning in the in-between: balancing a disparate range of materials, techniques, and external sources, they occupy multiple states simultaneously, pointing towards an underlying instability which, while certainly bolstered by ongoing developments in digital technology, has always been inherent to the relationship between object and image. In applying fresh strategies to a longstanding set of concerns, these works find their vitality in variability, at once embodying and extending the formal diversity, material inventiveness, and blurring of narratives that continue to drive his broader practice. James Fuentes is pleased to present "Emiter," a show of new paintings and sculpture by New York-based artist, Conor Backman. The exhibition finds the artist presenting four distinct, but interrelated bodies of work, each engaging the temporal nature of creative (re-)production while furthering his ongoing explorations of invention, representation, origin and iteration. Serving as the show’s centerpiece is a set of three oil paintings of rose bushes, each framed behind panes of tinted glass that range from a subtle grey to near black. The works’ subject matter engages ideas of sensorial presence while functioning as a neutral image – a normalized, almost readymade stand-in for representational painting situated between landscape, still life and portraiture. This measured presentation is reinforced by Backman’s treatment of his materials: each laboriously produced over several months spanning three years, the canvases have been rendered in detail, meticulously translated so as to disguise the artist’s hand. The tinted glass that frames each work, meanwhile, serves as an additional filter, obfuscating any lingering indication of painterly gesture while flattening the image in a manner not dissimilar to that of a computer screen. When approached closely, the glass functions like a black mirror, placing the viewer and surrounding environment within the frame through overlapping reflections, the work itself going in and out of focus behind the pane. In photographic reproduction, the frames can further conceal the paintings, or disappear altogether, depending on camera exposure settings. Hanging nearby is a previously unseen series of sculptural reliefs. Cast in marble and oriented vertically on the wall, these new works evoke eroded tombstones, their forms cropped to a lunar shape, their surfaces encrusted with cast lichen growths. Once again, Backman’s treatment falls somewhere between representation and abstraction, his textured sculptures of sculptures deftly mimicking the effects of temporal and elemental forces on what are already man-made markers of time. Characteristically, the resulting works create a series of conceptual loops, as Backman equates the procreative, circular qualities of natural processes with the self-generative nature of a studio practice. Backman has also included a new series of wall-hung assemblages in which found paint cans have been inserted into treated canvases. Housed within the cans are rear-painted Plexiglas inserts that serve as trompe l’oeil “paint,” their opaque monochrome surfaces evoking mirrors, clock faces and camera lenses. The canvases, meanwhile, contain imagery echoing the works that surround them: shaded foliage, water-smoothed pebbles, reflected sunlight, weathered stone. Rounding out the exhibition is a group of gray monochrome paintings, each framed under a layer of glass upon which Backman has mounted similarly colored cast lichens. The paintings are meant to mimic “gray cards,” the colored panels used by photographers to establish consistent image exposure and color balance while shooting. Reflecting roughly the same amount of light as the earth’s moon, gray cards are designed to serve as an index for accurate translation. Backman’s works, however, confound this function, as their neutralized hue ensures that documentation photos will collapse their layered compositions into a single, unified field - thus confirming once more an underlying, inherent instability in the relationship between image and object, copy and source. As is often true of Backman’s output, the items on view in "Emiter" suggest meaning in blurred narratives, each balanced firmly between painting and sculpture, original and image, authentic and simulated, actual and illusory. Layering references, fidelities and formats to purposefully disorienting ends, Backman’s output challenges our expectations of physical presence, the line between direct and mediated viewing experiences rendered suddenly concurrent. Super Dakota is pleased to present “Minium Paintings,” an exhibition of new works by New York-based artist Conor Backman. Addressing themes that have long driven Backman’s practice, the show comprises four distinct but interrelated bodies of work that similarly explore ideas surrounding the materiality of color, the relativity of scale, and the perceived spaces between subject and simulation. The exhibition takes its title from an orange-red, lead-based pigment found in oil and egg tempera paints. Its distinctive hue achieved through a process of oxidation, minium was widely used in the Middle Ages to decorate illuminated manuscripts, those meticulous renderings of image and text whose mobility offered a new means of diffusing information in the era preceding the printing press. That these illustrations came to be called “miniatures” is something of a false etymology: the term itself, derived from the Latin miniare (“to apply minium”) and miniator (“one who applies minium”), spoke not to size, but rather to the presence of a particular color; the word’s eventual equation with small, skillfully executed works of art arose over time, an upshot of linguistic confusion. 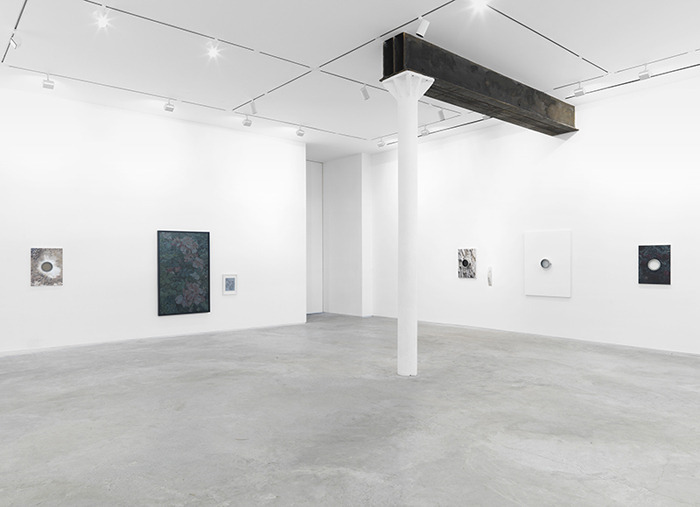 Evolving technologies, obscured derivations, layered depictions and crossed definitions: such motifs are central to the work on view in “Minium Paintings,” and indeed, to Backman’s broader practice, wherein production and reading alike tend to unfold as a series of translations, with methods of display and dissemination as vital to a given work’s meaning as its apparent content. The first group of works on view is a series of small acrylic and watercolor paintings on steel. In image, they depict subjects whose engagement with sculptural processes such as casting, carving, and slicing falls squarely between functional intervention, vernacular symbol, and cultural trope: mass-produced plastic Jack O’ Lanterns, bails of hay, an Easter Island bust, a bouquet of arranged flowers. As content, the banal nature of these subjects allows each depiction to read as a neutral image – a normalized, almost readymade stand-in for representational painting traditions ranging from landscape to still life. Offsetting Backman’s painstaking treatment, however, is the works’ diminutive scale: each image measures roughly two by two inches, echoing the average size of smartphone displays. Anticipating their eventual digital capture and reception, the paintings exploit the tension between mediation and accuracy that defines the online dissemination of images, confounding the expectation that an artwork viewed onscreen is always larger in person than in documentation. 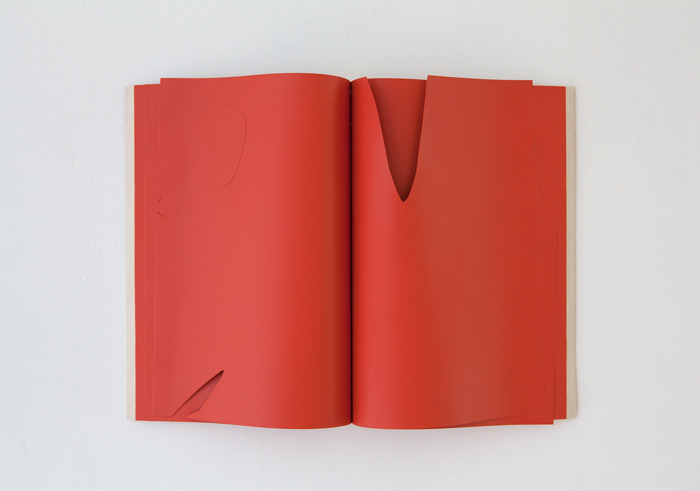 A second set of works further embodies the linguistic split that first drew Backman to the idea of “miniatures.” Here, the artist has produced a series of wall-mounted sculptural reliefs in painted aluminum and steel, each cast assuming the form of a booklet whose pages are variably carved and indented, the missing portions apparently sourced for collage material. While Backman has adopted a similar format in previous sculptures, the pieces on view distinguish themselves by their lack of imagery: where earlier works featured trompe l’eoil renderings of familiar motifs – stock imagery of cresting ocean waves, a textbook reproduction of Las Meninas – this latest set forgoes such representations in favor of a monochromatic treatment that draws our attention exclusively to the delineated patterns of each incised “page.” In both color and composition, these pared remnants recall the large-scale stabiles of Alexander Calder, whose signature shade of matte vermillion (popularly known as “Calder Red”) closely mimicked that of minium. In translating the formal effects of his mobiles to monumental structures, Calder sought to imbue the weight of painted steel with the airy yield of scored paper. Embracing the presumed neutrality of monochrome painting, he first rendered each pure-color cast as a small-scale maquette which, though technically the first step in a larger enlargement process, he considered an exhibition-worthy sculpture in its own right. Similarly balancing illusion and allusion, Backman finds in Calder’s project a shared set of concerns: among them, the adoption of artistic convention as raw material; the equation of process with meaningful content; the restaging of studio ephemera as legitimate output; and a visual disconnect achieved through shifts in scale and purposefully treated materials. The third group of works once again finds Backman sculpting recognizable forms out of foreign materials – in this case, sheet metal cut to resemble spiral notebook pages fashioned at one-to-one scale. Each “page’s” surface bears the texture of rust, its palette in keeping with the exhibition’s theme; but where the artist might otherwise have achieved this effect through manual replication, closer inspection confirms that, as with the pigment of minium, these ochre patinas have occurred organically, the steel oxidized by prolonged exposure to rainfall. In keeping, the series’ title, “Petrified x Blank Page,” speaks both to natural means of aestheticizing – as seen in corroded metal or fossilized wood – as well as to the idea of an artist’s inertia when confronting a vacant canvas. Characteristically, the resulting works function as a kind of recursive feedback loop, as Backman equates the procreative, circular qualities of natural processes with the self-generative nature of an engaged studio practice. Rounding out the exhibition is a collection of Backman’s trademark “Palette Paintings,” featuring reproductions of the palettes used to create the other works on view. Arranged neatly in a grid, the canvases comprise two modes of (re)production: in one, Backman copies his hue-specific plates in their original proportions, each offhand gesture rendered suddenly compositional; in the other, he uses hi-res digital photography to isolate a single dab of tube-fresh paint from each palette and, through methods of enlargement and tracing, renders the mark in exacting detail. Functioning simultaneously as documentation and deconstruction, the resulting canvases serve as a kind of index for the exhibition, relaying not only a chronological (read: performative) narrative of fabrication, but also a literal reference to external output, the works’ means of delivery once more afforded the status of autonomous artwork. Taken as a whole, the work collected in “Minium Paintings” signals a noteworthy development in Backman’s output: though they confirm the artist’s continued interest in blurred narratives and simultaneous states, these latest offerings find him approaching reproduction not as a process of reductive flattening, but rather of forged augmentation. Perfunctory tools elevated to deliberate compositions, painterly subject and digital simulation scaled to singular entity, steel forms assuming the weight of paper, carved metal surfaces laid over with rust: in each instance, we find the artist presenting his artworks almost as fossils, the items preserving traces of prior iterations while assuming fresh significance by means of cumulative physical change. Layering references, fidelities, and formats to purposefully disorienting ends, Backman’s “Minium Paintings” ultimately speak to a gap between encoded reading and direct perception, suggesting an underlying and inherent instability in the very notion of representation itself.